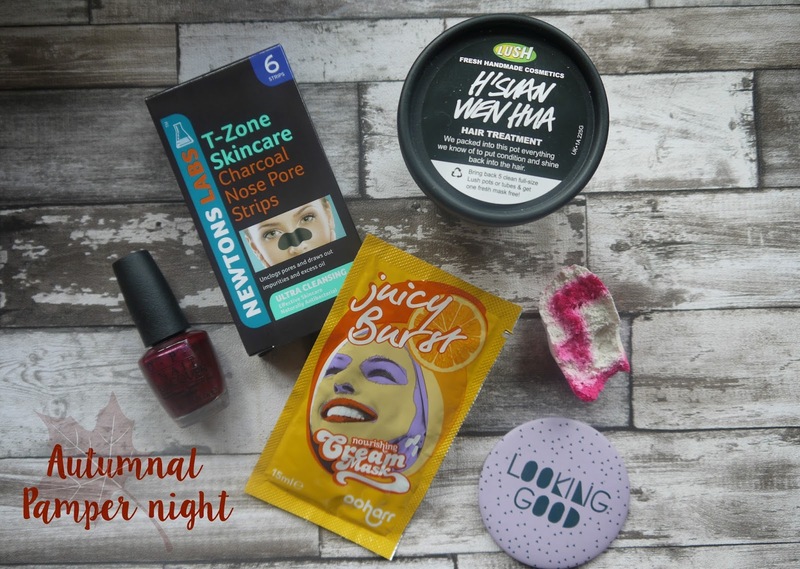 Hello lovelies, today I thought I would share with you all what I get up to on an 'autumnal pamper night in'. Firstly, I have pamper nights A LOT, I'm a home bird I don't go out very often at all, who can even stomach hangovers these days? Plus I have two young children under five and I just couldn't and wouldn't put myself through it on a weekly basis, once in a blue moon for me but that's how I like it! So, the only thing that makes this pamper night autumnal really is that I have my heating on full blast, candles everywhere (hope your imagining this in your head right now) , I have the cutest fluffy penguin socks on and my warmest comfiest pjs, oh and the autumnal nail varnish shade. You can't have a pamper night with out a face mask! I try all sorts of face masks, I was very kindly sent these Ooharr Juicy burst face masks from Amphora, I tried one in the morning and it made my skin feel so soft and supple and made my foundation go on a treat! I tried the other at night and woke up with a definite brightness to my skin, it wasn't dull looking as it usually does and picked me up. They are super affordable and easy to apply. I've never really been a fan of those tear of masks as they hurt, these are lovely and gentle and can just be taken off by a warm flannel, I'd definitely recommend trying these out especially you worry about dull looking skin and needing to get some moisture back in to your skin, these work a treat! After my face mask I like to apply some charcoal nose pore strips, I LOVE these, I am actually obsessed with them, I like to apply them after the face mask as my pores are all open from the warm flannel removing the face mask and let it sit on for a good 15-20 mins, I hate my pores on my nose and these really help to clean it out, I use these 3 times a week just because I worry about my nose pores. Whilst I'm face masking, nose pore stripping and painting my nails I have already applied my hair mask, the one I am currently using is the Lush H-Suan Wen Hua, it smells quite strong but I love it, the cinnamon scent and it leaves my hair feeling silky soft. I then like to give my brows a little tweeze, fake tan or moisturise depending on what day it is and give my self a little facial with all my favourite skin care products. Once I've done all this, had a good soak in the bath ( a lush comforter one of-course) I like to relax in my comfiest pjs and binge watch Netflix series or put on a new film I haven't seen or maybe flick through some magazines with a very large mug of hot chocolate covered in whipped cream and sprinkled with mini marshmallows! What do you need for your perfect pamper night in?